The new conservative government in Great Britain is doing all it can to promote unhealthy eating. First, it backed down on traffic-light food labels. Then, it took the food label regulatory functions away from its too-interventionist Food Standards Agency. Education Minister Nick Gibb has told MPs all new academies will not have to stick to tough rules limiting the fat, salt and sugar content in dinners…when asked if academies would have to comply with nutritional standards for school meals…Some existing academies are required to comply with these standards through their funding agreements. However, new academies will not be required to comply with nutritional standards for school meals. They will be free to promote healthy eating and good nutrition as they see fit. Oh. Voluntary guidelines. We know all about those. I’m not much of a TV-watcher but from what I’ve been hearing about Jamie Oliver’s new series, I thought I had best take a look. Don’t miss it. Get your kids to watch it with you. Oliver, in case you haven’t been paying attention, went to Huntington, West Virginia (ostensibly the obesity capital of the world), TV crew in hand, to reform the town’s school lunch program. Take a deep breath. Try not to get turned off by Oliver’s statement that “the food revolution starts here” (no Jamie, it doesn’t). Try not to cringe when he calls the food service workers “girls” and “luv” (OK, it’s a cultural problem). Remember: this is reality TV. With that said, let’s give the guy plenty of credit for what he is trying to do: cook real food. What a concept! And let’s cut him some slack for what he is up against: USDA rules that make cooking too expensive for school budgets, entrenched negative attitudes, widespread cluelessness about dietary principles as well as what food is and how to cook it, and kids who think it is entirely normal to eat pizza for breakfast and chicken nuggets for lunch, neither with a knife and fork. Food service personnel who not only care what the kids eat, but also know the kids’ names. For a school food program to work, all of these elements must be in place. That’s why the school food revolution must be achieved one school at a time. Watch Oliver go to work on these elements in this one school. Teacher that I am, for me the most moving – and hopeful – sign was what happened in the classroom. Oliver holds up tomatoes and asks the kids what they are. No response. Not one kid recognizes a potato or knows it as the source of French fries. How does the teacher react? As any great teacher, she recognizes a teachable moment and uses it. When Oliver returns to that class, the kids recognize and can name vegetables, even an eggplant. Addendum #1: Here’s Jamie Oliver’s TED talk. Addendum #2: the case against Jamie Oliver, courtesy of reason.com (unreason?). 1. Health Affairs: Thanks to Matt Gruenberg for alerting me to the issue of Health Affairs devoted entirely to obesity topics. Here’s the Table of Contents. The Robert Wood Johnson Foundation had a hand in this and discusses some of the papers on its website. Giving children the best nutritional start: With childhood obesity rates apparently sky rocketing around the world, celebrity chefs redesigning school meals, and international initiatives to influence what our children eat, now is an interesting time for child nutrition. Kids’ food trends in the spotlight: Some major trends in children’s eating habits could change as the economy recovers – but foods marketed as natural and healthful are here to stay, according to a senior analyst at Mintel. How characters can help children eat healthily: From Disney to Tony the Tiger, consumer groups have been campaigning hard to break the links between childhood icons and unhealthy foods. But furry friends and super-heroes are now putting in more of an appearance on healthy products. Kids’ TV food commercials down, but cross-promotions soar: Cross-promotions on food packaging targeted at children increased by 78 percent between 2006 and 2008, according to a study from Yale’s Rudd Center for Food Policy. 3. Michelle Obama’s campaign:USA Today reports on Mrs. Obama’s talk to the school nutrition association, the organization of people who work in school lunchrooms – those who Jamie Oliver refers to as “lunch ladies.” Check out the coverage and see the video. What is one to make of all this? Childhood obesity is a huge public health issue and deserves the attention it is getting. Let’s hope some of it works. Jamie Oliver, the British celebrity chef who has taken on school food as a personal crusade against childhood obesity – and with some success in Great Britain – wants to do the same for us. He is starting with a school in Huntington, West Virginia, a community that gives itself credit for being the unhealthiest in America. Thanks to NYU student Jessica Watkins for forwarding this video of his plans. The reactions of people in the community to Jamie’s ideas are especially interesting. This is the start of a TV series. Is his campaign about theater or is this real public health? I guess we’ll have to watch and decide. Update March 7: Here’s Jamie Oliver’s famous TED video. 1. The New York City Education Department announces new rules for school vending machines, as part of its new school wellness policies. According to the account in the New York Times, the vending machines have been empty since the Snapple contract ended in August (Really? That’s not what I observed a couple of weeks ago). The new standards will exclude the worst of the products but the lesser evils will still be competing for students’ food dollars, thereby continuing to undermine the solvency and integrity of the school meal programs. 2. The CDC reports (MMWR, October 5) that junk food is rampant in schools, but the percentage of schools in which children are not permitted to buy junk food or sodas is increasing in at least 37 states. To better ensure the safety of foods provided to children through the school meal programs, and to make improvements in three areas related to recalls affecting schools: interagency coordination; notification and instructions to states and schools; and monitoring effectiveness, the Secretary of Agriculture should direct FNS and that the Secretary of HHS should direct FDA to jointly establish a time frame for completing a memorandum of understanding on how FNS and FDA will communicate during FDA investigations and recalls that may involve USDA commodities for the school meal programs, which should specifically address how FDA will include FNS in its prerecall deliberations. develop guidelines, in consultations with the Agricultural Marketing Service (AMS) and the Farm Service Agency (FSA), to be used for determining whether or not to institute an administrative hold on suspect commodities for school meal programs. work with states to explore ways for states to speed notification to schools. improve the timeliness and completeness of direct communication between FNS and schools about holds and recalls, such as through the commodity alert system. take the lead among USDA agencies to establish a time frame in which it will improve the USDA commodity hold and recall procedures to address the role of processors and determine distributors’ involvement with processed products, which may contain recalled ingredients, to facilitate providing more timely and complete information to schools. This needs an editor, but you get the idea. 4. The GAO has produced yet another report, this one devoted to getting states to comply with federal rules about meal counting and claims. These are measures designed to make sure that ineligible kids don’t get fed. I wish I knew how much money such measures cost. They are a tragic waste. We need universal school meals. Period. 5. And then there is Jamie Oliver, who has transformed the British school meals system and is now attempting to bring his school food revolution to the United States (see the food issue of the New York Times magazine). One can only wish him luck. Let the school-meals revolution begin! Q: School is starting soon. Is there any hope that school food will ever improve? A: Yes, there is. The food revolution is upon us. Go into any school that has joined the revolution – many have – and you will see kids eating recognizable foods, helping themselves from salad bars, finishing what they take, all within the typical 30-minute lunch period. And nary a chicken nugget or soda in sight. Teachers in such places swear that the kids behave and learn better, do not bounce off the walls after lunch, and show fewer signs of eating disorders. From what I’ve seen, this miracle requires a committed principal, a dedicated school food service director, and at least a few teachers and parents who care what kids are eating. If the food service people know the kids’ names, it’s an especially good sign. With such elements in place, the food will be real and taste good enough for the kids to want to eat it. But the school food revolution can do more. It can turn the cafeteria into a teachable moment. I discovered that on my first teaching job when I saw how easy it was to teach biology through nutrition. Everyone eats. Schools can use what’s served for lunch to teach the chemical composition of food and its biological effects. They can use recipes to teach mathematics, food choice to teach political science, and the entire eating experience to teach literature, English or foreign languages. Kids can be taught about food plants and animals, how they are produced, and the associated monetary, labor and environmental costs. Ban the junk. Please, let’s. It’s time we got rid of vending machines, a la carte service and everything else that competes with federally funded school meals. If we did that, we wouldn’t have to have all those nutrient-based arguments about what’s allowed in vending machines. Kids need water? How about fixing the drinking fountains or supplying tappable containers of filtered water as I’ve seen done in the Berkeley schools. Big love to dinner ladies. This is Oliver’s way of calling for better support – financial, material and emotional – to the school food service people. I vote yes. Teach kids about food. Teach kids to grow, cook and taste food, and they will never look at fast food or food “just for kids” the same way again. Make school meals universal. Our present system requires a hugely expensive local and national bureaucracy expressly devoted to preventing kids who are deemed ineligible from getting free or reduced-price meals in schools. This ugly system stigmatizes poor kids and makes the kids of illegal immigrants go hungry. Why not just say that we think all kids should be fed breakfast and lunch while they are in school? Doing this would allow all that bureaucratic waste to be applied to the meals themselves, making it easier for the “dinner ladies” to obtain better food and be paid decent wages. The school year begins soon. Here’s your opportunity. Nutrition and public policy expert Marion Nestle answers readers’ questions in this column written exclusively for The Chronicle. E-mail your questions to food@sfchronicle.com, with Marion Nestle in the subject line. — The meal’s the deal. Oliver argues that when it comes to standards, it’s the entire meal that counts, not just the nutrients it contains. Personally, I’d take this further and argue for food-based standards – the offerings of daily food servings – rather than those based on percentages of nutrients, but that’s just me. — Ban the junk. Please, let’s. It’s time we got rid of vending machines, a la carte service and everything else that competes with federally funded school meals. If we did that, we wouldn’t have to have all those nutrient-based arguments about what’s allowed in vending machines. Kids need water? How about fixing the drinking fountains or supplying tappable containers of filtered water as I’ve seen done in the Berkeley schools. — Big love to dinner ladies. This is Oliver’s way of calling for better support – financial, material and emotional – to the school food service people. I vote yes. — Teach kids about food. Teach kids to grow, cook and taste food, and they will never look at fast food or food “just for kids” the same way again. — Make school meals universal. Our present system requires a hugely expensive local and national bureaucracy expressly devoted to preventing kids who are deemed ineligible from getting free or reduced-price meals in schools. This ugly system stigmatizes poor kids and makes the kids of illegal immigrants go hungry. 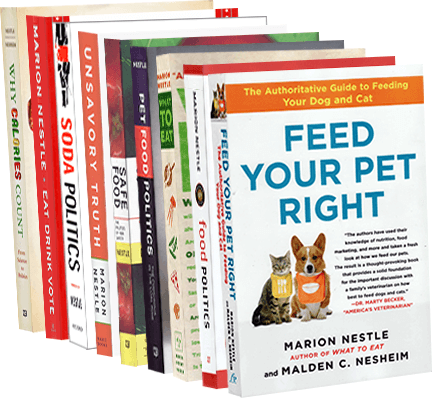 Marion Nestle is the author of “Food Politics,” “Safe Food” and “What to Eat,” and is a professor in the Department of Nutrition, Food Studies and Public Health at New York University. E-mail her at food@sfchronicle.com and read her previous columns at sfgate.com/food.